Whether you are writing a letter, an e-mail, a memo or a report, it’s a reflection of you, sets the tone for your leadership style, and is essential to your success. You must quickly and concisely express your point, and have it hit home so you get the results you want. The key is knowing exactly how to make your writing strong – and avoiding the most common and embarrassing mistakes managers make every day. ResourcefulManager's "Guide To Effective Business Writing" Blueprint comes with an unconditional, 100% money back guarantee. 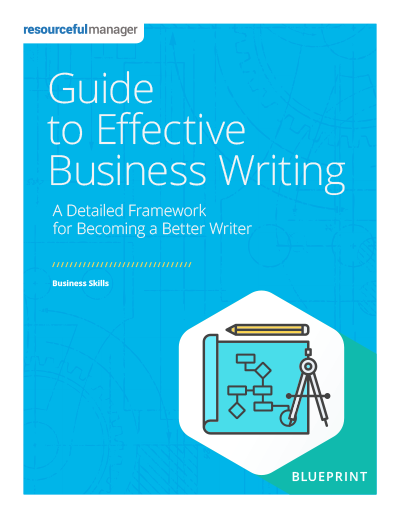 We're confident you'll find several new and useful ideas to help you improve your business writing, presented in a practical, easy-to-implement format. If you decide "Guide To Effective Business Writing" Blueprint doesn't deliver value or simply isn't your cup of tea, just email us at contact@resourcefulmanager.com within 90 days, and we'll process your complete, no-hassle refund in 1 business day or less.